UNIST Rowing team is posing for a group photo after winning the all-around victory at the 44th Jang Bogo Flag National Rowing Competition. The UNIST rowing team competes for national title at the 2018 Jang Bogo Flag National Rowing Championship. The UNIST rowing club has been honored with the Ministry of Oceans and Fisheries Award once again at the 44th Jang Bogo Flag National Rowing Championship, which took place at West Nakdong River Rowing Arena from August 24-25, 2018. 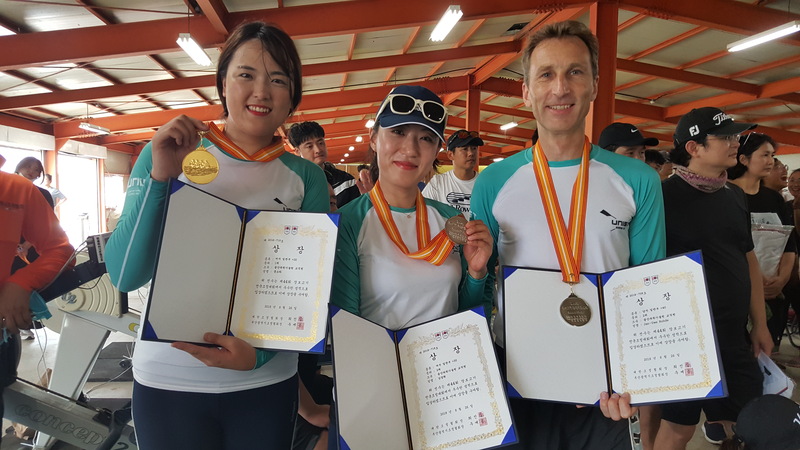 In the two-day rowing competition, UNIST was able to collect 9 medals with the all-around victory at both Women’s University Division and Men’s Division. With this, the club won the the Ministry of Oceans and Fisheries Award for the second consecutive year. The event was attended by rowers from universities and the general public and a total of 61 teams qualified for this year’s rowing competition. 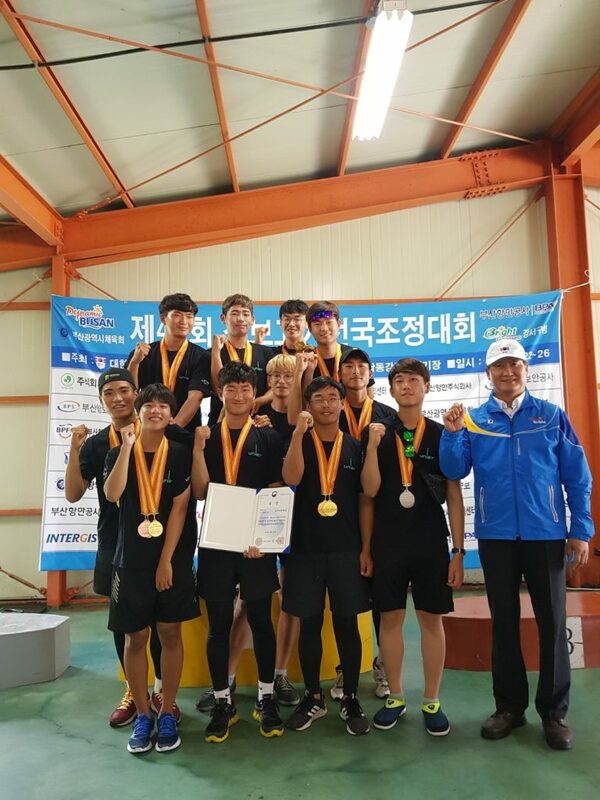 During the course of the event, the team has earned 3 Gold medals and 2 Silver medals in the Men’s University Eight, Knuckle-four, and the indoor sprint rowing races. The general group where UNIST staff members participated has been also honored with precious medals. They won 2 gold medals and 2 silver medals in the Women’s general division, thereby winning the Ministery of Oceans and Fisheries award. They also won a second place in the Men’s general division. The UNIST Rowing Club is a registered club sport, affiliated with UNIST. The club consists of students, faculty and staff who love to row, have fun, and get some fantastic exercise. The club was formed in 2013 and currently has 80 members, including faculty members. The club boasts 6 racing boats and 1 rescue boat. The primary objectives of the club are to foster and promote the sport of rowing at all levels. The team has also donated KRW 1 million of their prize money that they won from the recent Chungju City Mayor Cup National Rowing Competition toward UNIST Endowment Fund. Universities such as POSTECH and DGIST, including UNIST, are actively supporting coordination to foster global leaders. These universities hold an exchange exhibition in the Taehwa River in Ulsan in September. The exhibition will provide a variety of events such as a rowing machine adjustment experience for citizens, which will help many citizens to take a step closer to the regulation event.